Wayag Island is part of Raja Ampat Regency and it becomes a recommended destination to enjoy beautiful seascape and the Wayag Karst. A majestic karst is located in such island, attracting many tourists and nature lovers. 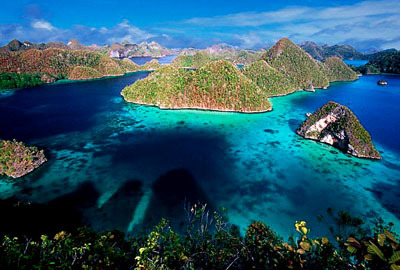 The location is in the northwest of Waigeo island and it requires a short boat trip to reach it. Being a popular object in Wayag Island, the karst keeps luring more visitors. Most of them are photographers and casual tourists, actually. The fact is that several foreigners are also seen in the location during holidays. It is because they want to witness such iconic landscape directly. The most noticeable thing about Wayag Karst is the size, which is bigger than other karsts in Raja Ampat Regency. It appears strong and big. No wonder, people can get easily stunned by it. On the karst, many bushes and several trees grow beautifully. That means the karst is dominated by both green and gray color. This explains why the object becomes photographers’ favorite in the location. Not to mention the water is quite calm and pristine. That means any boats can get near to the karst easily. It is true the villagers have decided to reduce a number of visitors to their homeland. That means the public access to the location has become difficult ever since. In order to take care of the issue, tourist agents choose Kawe Island as the prime checkpoint before reaching Wayag. The purpose is to pay some money to villagers. This helps any tourists to enter Wayag in an easier manner, after all. In the end, everyone has the chance to witness such majestic karst of Wayag. With flawless nature and beautiful sea scenery, Wayag Karst acts as the prime attraction in the location. From the boat, tourists are able to enjoy sightseeing or photography. Moreover, it will be more memorable if they come during the right times, which are during dawn or dusk. Why is that? They have the chance to see either sunrise or sunset. The karst even looks better at those times, having the background of the beautiful sun. Even couples can take advantage of such nuance, which is romantic and mesmerizing. Once tourists visit and witness Wayag Karst, they may continue their journey to nearby tourist attractions such as Kawe and Waigeo Island. Each of them offers distinct beauty and lures, so visitors would never get bored there. When it comes to accommodations, most of them are available in Waisai City. These include hotels and homestays that come with different prices. As for the transportation, it is better to rely on a tour agent. Their team would take care of everything, including transportation services and places to stay. As the name suggests, the karst is located in Wayag Island. The prime checkpoint is Sorong City, especially the Domine Eduard Osok Airport. From there, tourists can continue their trip to Sorong Port and take a speedboat to reach their final destination. Despite the expensive price, it is a fast and convenient transportation choice. The voyage takes about 5 hours, so it will be tiring and time-consuming! In this case, tourists should have prepared some snacks and bottled water beforehand.